Hurry up and wait! This seems to be the order of the day as Pakistan and India take tentative steps towards normalcy. After much trumpeting of the visa accord signed in Islamabad after External Affairs Minister S.M. Krishna’s visit and discussions with Pakistan’s Foreign Minister Hina Rabbani Khar, the maw of the bureaucracy appears to have swallowed the agreement and refuses to release it. The latest out of Islamabad is that the Cabinet still has to approve the agreement. Surely, the paperwork for such an approval must have been readied before the accord was signed. Conspiracy theorists will have a field day as to the cause of the delay. Even the often-blamed Pakistan military favours ending the “no-war no-peace” situation with India, so it can concentrate on the domestic threat of militancy. Meanwhile, people who wish to travel from both sides of this fractious border remain in suspended animation. Overseas consulates of both countries have yet to receive orders to ease up on restrictions. Not that the new accord represents a radical leap forward. It is marginal at best and it appears rather than simplifying the visa regime, officials decided to make a dog’s breakfast out of it, creating new categories and slicing and dicing the different visas so they will keep the “babus” occupied. Despite these hurdles, bravo to those officials who keep issuing visas, often at short notice, on their own recognisance. And bravo to the home ministries that have not taken them to task for their transgressions. On a recent visit to Pakistan and India, I was struck by the hundreds of Indian visitors to Lahore under the aegis of Aman-ki-Asha for different events, including a high tempo India-Pakistan Management Summit. The sentimental outpouring on the final day of this summit, where I was also asked to speak, was astounding. “Jinay Lahore nahin waikhiya oh jammiah hi nahin (Whoever has not seen Lahore has yet to be born! )” seemed to be the Punjabi slogan of the day. If India and Pakistan are to expand their economic horizons, then they need only start in their own neighbourhood rather than reach out across the seas. Let the business sector take the lead. This makes economic and political sense, as it will empower their people and create jobs and trade opportunities along the Grand Trunk Road. Much more than any New Silk Road initiative that will become moribund if Pakistan remains a recalcitrant barrier between Central Asia and India. Common prosperity should contribute to creating security over time. People on both sides of the border appear ready. In Lahore not long ago, a lawyer swept aside the curtains in his office and showed me a new building going up next to his offices near the high court. No, this was not a new set of offices for the legal eagles. Rather the owner had told him that he was building a hotel in anticipation of the flood of Indian visitors across the Wagah border. Trade follows people and vice versa. Studies, among others presented by Mohsin Khan at the South Asia Center of the Atlantic Council, indicate that potential for trade between India and Pakistan, at the same level as in 1947, could touch $100 billion (Rs 500,000 crore) a year, making Pakistan one of the top three trading partners of India. Up from some $5-6 billion (Rs 25,000-30,000 crore), of total trade via official, indirect, and illegal channels today. The window of opportunity for politicians on both sides of this divide is narrow. The elderly leaders may be losing touch with their increasing youthful populations. Pakistan’s median age is 21 years, India’s 25 years. The average age of a minister in the Indian Cabinet is reportedly 65 years. Pakistan may have the edge in that department, as the gap between their two foreign ministers indicates. But it is time the politicians took action that would give their youth a greater chance to carve out a peaceful economic future. Indian Deputy National Security Adviser Lata Reddy talked at a gathering I attended in New Delhi about the need for India to create an “integrated neighbourhood” if it is to successfully face an uncertain future attended by “complexity”. She warned of the nexus between climate change, rising populations, and increasing inequalities. Amen to that. War has failed both India and Pakistan. As most of my interlocutors in Pakistan and India on this visit told me, it is time now to wage peace. 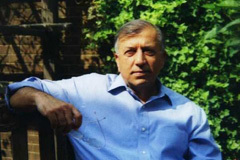 Shuja Nawaz is director of the South Asia Center at the Atlantic Council and author of Crossed Swords: Pakistan, Its Army, and the Wars Within. This piece was originally published in India Today. On October 17, the Atlantic Council’s South Asia Center hosted a discussion entitled, “Combating the Global Improvised Explosive Device (IED) Threat,” with Lieutenant General Michael D. Barbero, director of the Joint Improvised Explosive Device Defeat Organization (JIEDDO). The use of IEDs by militants has made IEDs an enduring threat for both military forces and civilian populations worldwide. The Joint IED Defeat Organization has become the US Department of Defense’s lead unit for countering IEDs in critical areas such as Afghanistan and Iraq. Though IED attacks in Afghanistan have become more frequent over the past several years, JIEDDO operations have helped reduce the number of casualties in IED attacks by more than 40 percent since 2011. How will defense budget cuts affect supplemental operations like JIEDDO? What is the likelihood of IED threats to rise after 2014? Lieutenant General Barbero addressed these questions and provided an overview of the current JIEDDO mission in Afghanistan and the region. Lieutenant General Michael D. Barbero was commissioned in the Infantry upon graduation from the United States Military Academy at West Point in 1976. In addition to Infantry assignments at the tactical level, he has commanded at every grade, from lieutenant colonel to lieutenant general. As a brigadier general, he commanded one of the Army’s Combat Training Centers, the Joint Readiness Training Center and Fort Polk. As a major general he commanded the United States Army Infantry Center and Fort Benning Georgia. Prior to joining JIEDDO, he served over three years in three separate tours to Iraq where among his many duties, he commanded the Multi-National Security Transition Command–Iraq and NATO Training Mission-Iraq. Lieutenant General Barbero holds a master’s degree in national security and strategic studies from the National Defense University, Washington, DC. He is a graduate of the Army’s Command and General Staff College and the School of Advanced Military Studies Program. His awards include the Defense Distinguished Service Medal, Defense Superior Service Medal, Legion of Merit and two awards of the Bronze Star Medal. He has also earned the Expert Infantryman Badge, Parachutist Badge, Air Assault Badge, Ranger Tab, Australian Jump Wings, and both the Army Staff and Joint Staff Identification Badges. To read more please click here. The Atlantic Council’s South Asia Center held a discussion on philanthropy in Pakistan with Robin Raphel, senior adviser on Pakistan, Office of Special Representative for Af-Pak, US Department of State; Qaisar Shareef, executive volunteer and USA representative, I-Care Fund America; and Farrokh K. Captain, chairman, i-Care Foundation and director, Shell Pakistan, Limited. South Asia Center Director Shuja Nawaz moderated the discussion. Philanthropy plays an increasingly important role in the world, through the support of critical issues such as health, education, and human rights. Pakistan is no exception to this phenomenon, but faces a series of challenges to increase the level of philanthropic investments within the country, by domestic and foreign (including diaspora) donors. Lack of transparency and limited information about social impact organizations on the ground has led to low levels of donor trust. In a country where the need for philanthropic investment is greater than ever, what are the avenues for providing support for important causes within Pakistan? How can challenges such as impact and accountability be addressed to ensure that donor funds are being effectively spent? What is the role of government and public-private partnerships in facilitating philanthropy within Pakistan? These and other key questions regarding the challenges and opportunities for philanthropy in Pakistan were addressed. Ambassador Robin Lynn Raphel is a career diplomat who is currently the coordinator for non-military assistance to Pakistan with the rank of ambassador. She has been the ambassador to Tunisia and assistant secretary of State for South Asian affairs during the Clinton Administration. In this capacity she managed US relations with the newly formed Taliban government in Afghanistan. She also served as a member of the Iraq Reconstruction Team during the Bush Administration, and as senior vice president at the National Defense University in Washington. Ambassador Raphel previously worked in the Office of Investment Affairs in the Economic and Business Bureau; on the Israel Desk; staff aide for the Assistant Secretary for the Near East and South Asian Affairs Bureau; and as special assistant to the Under Secretary for Political Affairs. In 1984 she was assigned to the US Embassy in London where she covered Middle East, South Asia and East Asia, and Africa. She served as counselor for Political Affairs at the US Embassy in Pretoria (1988–91), and at the US Embassy in New Delhi (1991–93). In August 1993, she was named the first assistant secretary of State for South Asian Affairs. She retired from the State Department in 2005 after thirty years of service. The Obama Administration appointed Ambassador Raphel as a member of the team of the late Richard Holbrooke, the special representative to the Af-Pak region. Ambassador Raphel received a BA in history and economics from the University of Washington and earned a MA in economics from the University of Maryland. Mr. S. Qaisar Shareef is the executive volunteer for i-Care Fund America, Pakistan’s first donor advised charitable fund. He recently concluded a nearly thirty-year career with Procter & Gamble. Most recently, he headed up the P&G operations in Pakistan; a role in which he served until early 2011, before returning back to the United States. During his time as country head at Procter & Gamble Pakistan, Mr. Shareef worked closely with several nonprofit organizations engaged in providing education to the underprivileged and in disaster relief. He is a charter member at US-Pakistan Foundation, serves on the board of HOPE USA, and is the representative of i-Care Fund America in the United States, where he serves as executive volunteer. P&G Pakistan received the Award for Corporate Excellence from the US State Department in Washington, DC, recognizing the company’s contributions in corporate social and environmental responsibility, and it’s excellence in community engagement. Mr. Shareef is originally from Pakistan and first moved to Cincinnati in 1977. He has a BSc in management from the Middle East Technical University, in Ankara, Turkey, and an MBA from the University of Cincinnati, Ohio. Farrokh K. Captain serves as the director of Shell Pakistan Limited, and chairman of the i-Care Foundation, a donor-advised fund in Pakistan. After completing a BA and MA from the Massachusetts Institute of Technology, he worked as a management consultant with Arthur D. Little First in Cambridge, Massachusetts, and then went on to establish their practice in Pakistan. From 1978 to 1994 he lead a US-Pakistan joint venture chemical manufacturing business in Pakistan: Captain-PQ Chemical Industries (Private) Limited. He is also a member of the Board of the American Business Council. Mr. Captain later stepped back from active business, turning this over to professional management, and focusing on the social sector. In addition to serving as chairman of i-Care Fund America, he is a trustee of the Layton Rehmatulla Benevolent Trust, a much-renowned chain of ten hospitals for curable blindness spread throughout Pakistan, which treats 1 million patients per year free of charge, and to-date has treated 10 million patients. Since 2002 he has served the Human Development initiative in Pakistan as chairman of the Pakistan Human Development Fund. Presently he is also a member of the Special Cabinet Committee for Human Development, and chair of its Committee for determining Pakistan’s future literacy programs. He is also a director of the Mobilink Foundation. Mr. Captain has served for thirty years as MIT’s regional chairman for Pakistan and is chair of the recently accredited MIT Enterprise Forum of Pakistan. He is also a member of the Pakistan Board of The Acumen Fund, a novel new entrant to the Pakistani social service sector, operating in the field of social entrepreneurship.